The most severe immunodeficiencies are those that affect both B and T cell responses. 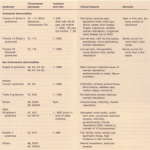 These can stem from a variety of defective mechanisms in lymphocyte function, but tend to have rather similar clinical features, combining the opportunist infections of cell-mediated immunodeficiency with those of antibody deficiency. This typically presents in the first weeks of life. Failure to thrive, absent lymphoid tissue, lymphopenia and hypogammaglobulinaemia with multiple severe infections are characteristic. 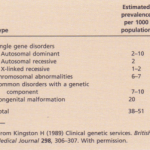 There are primary Xvlinked and autosomal recessive variants of SCID. Other causes include adenosine deaminase (ADA) deficiency, in which a defective purine salvage enzyme that is expressed in all cells, has a particular effect on lymphocytes due to the accumulation of substrates and metabolites that interfere with lymphocyte function. An analogous disorder is seen in purine nucleoside phosphorylase deficiency. Non-expression of MHC class II and reticular dysgenesis cause similar syndromes. Milder expressions of these defects exist, some presenting in later life, and are sometimes termed benign combined immunodeficiency or Nezeloffs syndrome. Even with supportive and antimicrobial therapy, most of these conditions have a very poor prognosis without reconstitutive therapy. Immunoglobulin therapy is effective for the antibody deficiency, but the cell-mediated opportunists are the main determinant of outcome. Bone marrow transplantation is the definitive approach and has had significant success, especially if undertaken before extensive infection has set in. Recent approaches have included attempts to restore the defective enzymes in ADA deficiency and gene therapy is now being attempted. 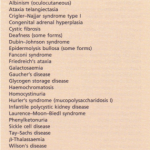 Others Other combined immune deficiencies include the following. WISKOTT-ALDRICH SYNDROME is an X-linked defect with associated eczema and thrombocytopenia; a mainly cell-mediated defect with falling immunoglobulins is seen and autoimmune manifestations and lymphoreticular malignancy may develop. ATAXIA TELANGIECTASIA patients have defective DNA repair mechanisms and have cell-mediated defects with low IgA and IgG2; lymphoid malignancy is again common. 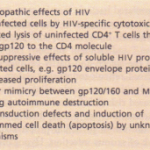 EBV-ASSOCIATED IMMUNODEFICIENCY. Apparently normal, but genetically predisposed (usually X-linked) individuals develop overwhelming EBV infection, polyclonal EBV-driven lymphoproliferation, combined immunodeficiency, aplastic anaemia and lymphoid malignancy. 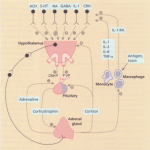 EBV appears to act as a trigger for the expression of a hitherto silent immunodeficiency. PROTEIN-CALORIE MALNUTRITION is a very common cause of acquired combined immunodeficiency, with predominantly cell-mediated defects. Mechanisms are not fully established. Measles is a major cause of morbidity and mortality among children and Pneumocystis carinii pneumonia is also a major pathogen; indeed, it was in this setting that Pneumocystis was first seen in the Warsaw ghettos. REDUCED ANTIBODY PRODUCTION. IgM synthesis does not occur before 30 weeks’ gestation; IgG production does not occur until several weeks after birth. Low LEVELS OF MATERNAL ANTIBODY, as active placental transfer of IgG does not occur until the third trimester. Antibody levels continue to drop after birth due to loss of maternal IgG. INVASION OF FOREIGN BODIES, such as indwelling catheters. ANTIBIOTIC THERAPY, reducing colonization resistance. Breast milk has several protective properties including secretory IgA, lysozyme, lactoferrin, leucocytes and small amounts of IgG, IgM and IgD. Colostrum is particularly high in antibody, and provides IgA to protect the gastrointestinal tract.